Lipper International provides exceptionally valued items for the kitchen, home, office, and child's playroom. Known for their functionality and beauty, each of our products is individually crafted from the finest quality materials. 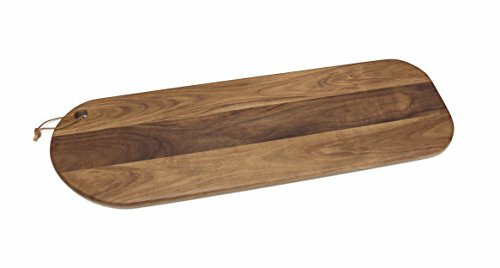 This Rounded Serving Long Board can be used for cutting or serving and also has a strap for hanging makes storing easy and practical. It is made from durable and Acacia that is both contemporary and functional. Use it to serve cheese, crackers, and hors d'oeuvres. Hand wash with a mild soap and cool water. Do not soak. Do not put in the dishwasher, microwave or refrigerator. Extreme changes in temperature will cause the material to crack over time. Dry thoroughly. Occasional use of mineral oil will help maintain its appearance. Certified International Vera Cruz Melamine Chip & Dip Server, 14"